Hi guys! I’m off to the airport today for 2 weeks in northern Italy, visiting family (who we don’t speak the same language as), drinking lots of wine, eating my fair share of gelato and just enjoying not working. I would’ve loved to say that I’m superwoman and got 2 weeks worth of posts all banged out for you ahead of time but that kind of proactivity is just plain laughable. So instead, we’re going to change things up with some guest posts from some of my favorite ladies on the internet and their delicious food. I will try to pop in with some Italy updates over the next 2 weeks but I’m not promising anything because I have no idea what the internet situation will be like. If your comments go unanswered, that’s why. I swear I’m not ignoring you. I have a max of 300mb of data (do you even know how ridiculously low that is?!) to use on my phone before I get charged overage fees so we’re keeping things to the bare minimum. I’m telling myself it will be a good detox. Ha. Katie is first up because she is superwoman and had this post to me weeks ago. Katie’s blog is one that when I see a new post pop up in my reader I get legitimately excited to read it every single time. She’s been a crossfit inspiration (I may or may not have ordered the same shoes as her…hi, stalker), a paleo role model and I adore her photography. So I’m sure you’ll love her post, her pictures and her recipe. Enjoy! Hello all, I’m Katie from KatieDid and I’ll be sharing a recipe in place of Gina today. I’d first like to thank Gina for having me guest post while she’s off scaling the leaning tower of Pisa and diving into a pool of gelato….. or something like that. But really, her well thought out, beautifully photographed, and mouth watering posts and recipes always keep me coming back for the next one, so I’m truly honored to be posting today on a favorite blog of mine. 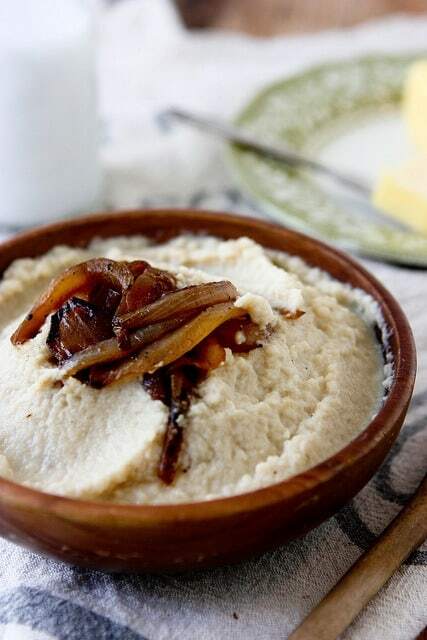 Brown butter and caramelized onion mashed cauliflower is a delicious paleo recipe that will have you forgetting about the potatoes. While Gina is twirling in plates of spaghetti, I’m bringing you a grain free recipe. The irony. I’ve adopted a paleo style diet over the past year or so. It was a long, slow process but excluding grains, sugar, some starches, soy, most dairy, and corn from my diet has been one of the best decisions I have made for myself. But something about not being allowed (I use that term lightly) to eat something (aka potatoes on a paleo diet) makes me sometimes crave a buttery, creamy side dish like mashed potatoes. Go figure. The caveman’s potato, rice, pizza crust, and probably 50 other things that creative paleo eating people have come up with. You might have seen this mashed cauliflower recipe before. I’m not reinventing the wheel here, just sharing my own spin on this rich, comforting, creamy side dish. And by rich I do mean several tablespoons of browned butter. Yeah, paleo isn’t so bad. Slice onion and caramelize in 1 tablespoon of butter over medium-low heat for about 15 minutes, stirring constantly to avoid burning. Once completely caramelized remove from the pan and set aside. I also threw in the three cloves of garlic towards the end to release some of their flavor. Meanwhile, cut off the cauliflower stem and break into florets. Place in a casserole dish and fill with water until about 1/4 of the florets are covered. Microwave for 5-7 minutes, until they are soft. Place cauliflower and 3 garlic cloves into a food processor (may need to do this in batches if your processor is not large enough) and process for a few minutes. Over medium heat add 2-3 tablespoons of butter and stir constantly until just beginning to brown, about 3-4 minutes, don't let it burn! And try not to drink it straight from the pan. Add 1/2 of the caramelized onions, browned butter, and a healthy pinch of salt and pepper to the cauliflower in the processor. 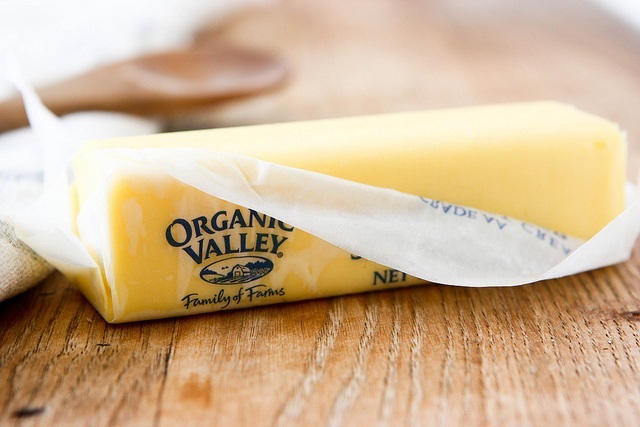 Process and start adding in coconut milk until fully incorporated and a smooth, creamy mash has been formed. This may take several minutes depending on your food processor. Taste and adjust salt (I added quite a bit!). Gina, Have a fun and safe trip!! I am so jealous! I want pizza and gelato from Italy! Yummy!! Share lots of pictures!!! Hi Katie, Your Cauliflower dish looks amazing!!! What a great way to use cauliflower!! Thanks again Gina, hope you’re off having a blast!! I saw the words caramelized onions and it could be over a boot…I’m in. I am drooling. This is amazing. Have a fun trip!! Have a wonderful trip Gina! Katie this looks amazing. As a self-proclaimed mashed potato junkie, I actually really love mashed cauliflower, it has a very similar texture and a great rustic and earthy flavor. 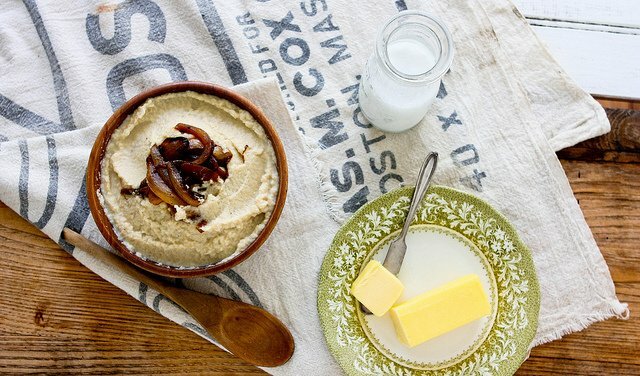 I love your addition of the browned butter and caramelized onions, two things that can really do no wrong :) Thanks for sharing, I cannot wait to try! Oh my gosh this looks AMAZING!! have so much fun in Italy Gina!! I can’t believe how creamy that looks! 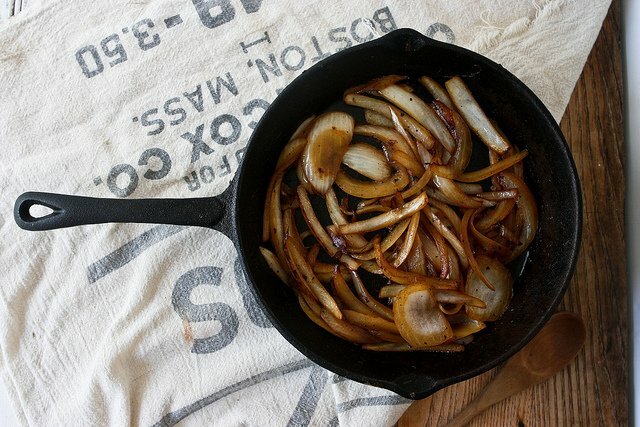 I mean what’s not to love about brown butter and caramelized onions? Katie – my boyfriend is on the same diet and will be fanatically happy if I make this one night. Bookmarked! Gina – I can’t WAIT for your Italy stories. Have a blast. Katie – you’re like a grown up version of my 5 year old. And I don’t mean that in a bad way, especially since I don’t know you ;) She refuses to eat mashed potatoes but loves canned cranberry sauce. Go figure! I still can’t figure out how either of you can do the no sugar, no dairy thing. I’d die. Mashed cauliflower is my jaaaaam. And the onions on top…drooling. Have a great trip Gina!! This dish looks incredible! 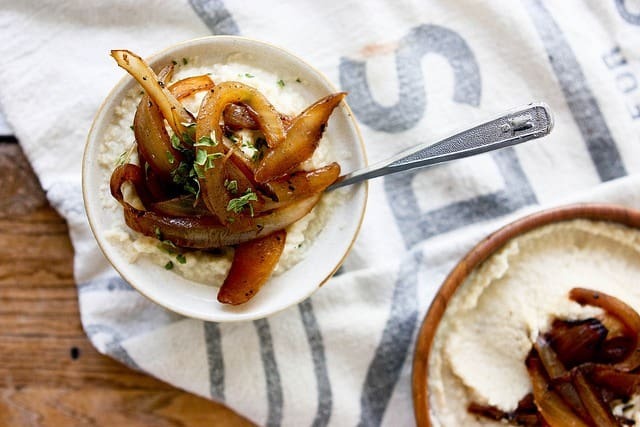 I am not a fan of mashed potatoes either, but I like cauliflower – so I would love to try with with those gorgeous onions! This looks amazing. I might just have to “pin it. ” I just found your blog and very excited that I did so. Gina! Have a lovely trip! I’ll miss your posts! Katie — nobody presents simple meals in the same way that you do. You’ve got such a knack for recipes with short ingredient lists but big flavour! And I can say that with full authority, because I made this meal tonight about .34 seconds after reading the post. So perfect! wow thank you katie! So glad you already made and liked it :) I do like to keep ingredients to a minimum for sure. 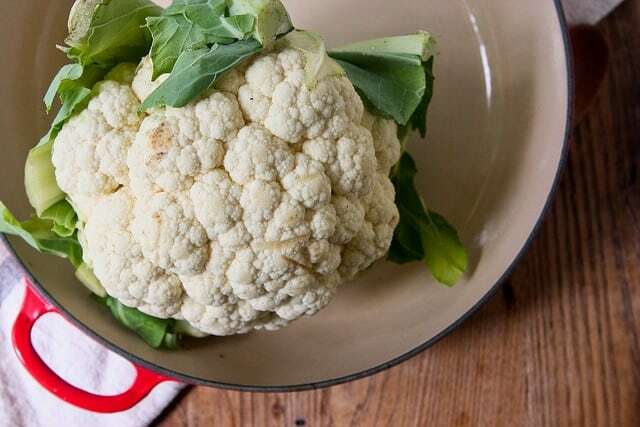 Cauliflower is one of my favorite fiber-licous veggies! What a great way to incorporate it into a meal. I love it!! As long as you can ask for food, and the bathroom you’ll be okay as far as the language barrier! Knowing please and thank- you is also good to know. Hope you have a great trip! Saw this the other day and finallybought the ingredients this evening. Makes me wish I had a food processor. Mashed by hand. Probably not as smooth as by the processor. Really liked it. Very glad I tried it. Now to prepare for my SAD CW friends. I made this but substituted organic heavy cream for the coconut milk. It was delicious.